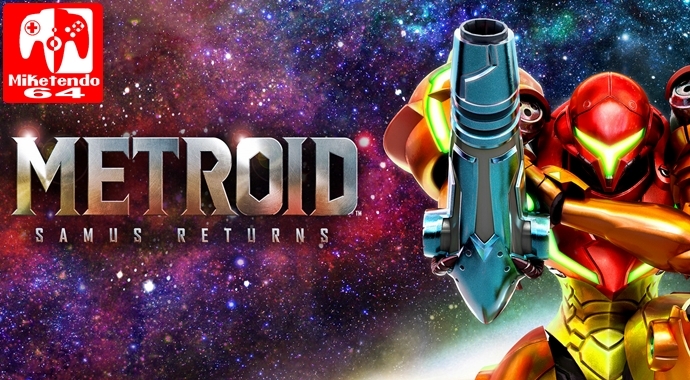 In the year 1991, bounty hunter Samus Aran of Metroid fame was given a sequel and that sequel was none other than Metroid II: The Return of Samus and just like she made a return back then, Samus is back to her old tricks as Samus has returned once again, to do what she does best, eradicating Metroids! Metroid: Samus Returns may not be an entirely new adventure as it is a remake of the 1991 game that released on Game Boy, but being as though Metroid II: The Return of Samus is one of the most iconic games in the series, due to the ideas and storyline that stemmed from it, it wasn’t as warmly received as it could have been from critics. Sure they praised the game on its story and setting, but Metroid II received a lot of hate due to its graphics. Areas were “bland and repetitive” and some enemies were just straight up blocky. Well as far as Metroid: Samus Returns is concerned, “bland and repetitive” is no longer the case. In a bid to recreate the fantastic world and plot previously established, Spain based MercurySteam went all out to ensure history would not repeat itself, only just because they were involved with the game’s development, they’re not the only party who deserve some credit. Also heavily involved with Samus Returns is Metroid Series Producer Yoshio Sakamoto. Not only is he a Legend in his own right for his work on various Metroid games, but he’s practically been involved with every Metroid game going, except The Return of Samus. Clearly this must have been a regret of his, as for the last few years, it has been Sakamoto’s dream to remake the classic Metroid II, only it never worked out for him, until came the day when MercurySteam expressed a desire of their own to remake a Metroid game. Instead of saying “yes,” Sakamoto actually turned them down, only to then turn around and ask them if they’d be interested in helping him make his dream make become a reality and if it wasn’t obvious, MercurySteam said yes and the end result is utterly sublime! Despite my secreted hopes of being able to get a digital copy of Metroid: Samus Returns early, I never actually expected Nintendo to do just that, since press demand for this game is insane, and yet, Nintendo UK was able to send me a copy and after that first whole hour of constant gameplay, all I could think was “Wow.” Despite all the previews, the videos and everything I had learned and read up on it prior to actually having the full game in my possession, I really was not prepared for the experience that awaits any gamer that picks up Metroid: Samus Returns this week. It is not just a remake that does a few things better, it’s a remake that does everything better. Once upon a time, Samus could only shoot diagonally, but now, she can shoot wherever she pleases, thanks to 360 degrees of free aiming. In fact, Samus is so capable of firing wherever she wants that even when she is hanging onto a ledge, or just leaping/falling through the air, she can point her Arm Cannon at the closest visible enemy and make it cannon fodder. Fortunately for Samus though, while the local wildlife are aggressive and rather jerkish at times, thanks to the X button, Samus now has an upwards striking Melee counter and if she lands her blow, whoever you’re against will be momentarily stunned, which gives you ample opportunity to show them as many times as you could. Oh and just in case it wasn’t obvious, this was an idea from MercurySteam as they actually did a similar thing with Castlevania: Lords of Shadow – Mirror of Fate. But just like everything else being more aggressive than ever, as are the Metroids Samus is tasked with taking down. Whereas a lowly Alpha Metroid in Metroid II only required about 5 missiles to take them out, now it’s a full on death battle and I absolutely loved it! Even the weakest Metroids in the game, can be as deadly as the toughest of Metroids encountered later on, if you’re not careful, but as long as you know your Metroid history, those battles can be made a little bit easier. One discoverable ability in Samus Returns is the Ice Beam, which means if you are able to charge up a full powered Ice Beam shot thanks to the Charm Beam ability, and pop a Metroid in its weak spot, you can momentarily crystallise it in ice and give it a front-row ticket to the gun show as you light it up like the 4th of July! Besides harder battles, a more combat driven focus and much better graphics that are shown off in 2.5D platformer fashion (two-dimensional plane with three-dimensional graphics,) and abilities that wasn’t available in Metroid II, purely as they weren’t implemented into the Metroid series back in 1991, which includes Aeion abilities like Pulse Scan and Lightning Armor, but it also has amiibo support. Although while some aspects of amiibo support is pretty cool, like the fact that Metroid: Samus Returns supports both the Samus amiibo as seen part of the Smash Bros. amiibo line, but it also supports two new Metroid related amiibo, with one actually being a Metroid amiibo. Only while the new and old Samus amiibo can be used to unlock an extra energy tank and exclusive Metroid II art for an art gallery once you beat the game, which is something you can take or leave, for anyone who would like to experience the full Metroid: Samus Returns experience, you’re going to have to purchase the Metroid amiibo as well. Why? Well in addition to being useful for revealing the location of any nearby Metroid on your map, which is displayed on the 3DS’ lower screen, but when you eventually beat the game, the Metroid amiibo allows you to unlock Fusion Mode, which is an even harder version of the game (even harder than Hard Mode, which can only be unlocked by beating the game on Normal,) except you get to wear the Fusion suit as well. I know Nintendo has done this before, using amiibo to access extra content in a game, much like they did with the Wolf Link amiibo being a requirement in order to access the Cave of Ordeals, but since Metroid has a smaller fan-base than Zelda does, it does feel a tad like an unnecessary attempt to milk a bit more coin out of Nintendo’s Metroid fans, who have had to wait for over 13 years just to get another 2D Metroid title. But the amiibo looks awesome, so you just know it’s going to sell regardless, but that doesn’t make it any better. Aside from all the changes and new elements that do a great job of making Samus Returns feel right at home when comparing it to other games in the Metroid series that released more recently, it is still very much so an old school Metroid game in all the best ways, whilst also adhering to the plot of Metroid II. A plot which consists of the discovery of the Metroid species on the Planet 2R388, by a Galactic Federation research team in the year 20×5 in the Cosmic Calendar. The research team are able to secure a living organism, only while they make their way back home, the ship the team is on, is attacked by Space Pirates, who intentionally instigated such an attack. Why? Because the Space Pirates desire the Metroids and wish to replicate the “sample” that was secured and exploit the Metroid’s ability to absorb energy from all life-forms, as a means of building weapons that can be used by the Pirates to take over the galaxy. With no other choice and a threat that needs to be eradicated, the Galactic Federation dispatches a single bounty hunter to take infiltrate the Space Pirate’s base on Zebes and take out the threat. The mission would not be easy and Samus really did have her work cut out for her, thanks to the likes of Mother Brain, who was the final boss in the first ever Metroid game, but against the odds, Samus’ mission was a success. The Metroid were eliminated and the threat was gone for a time, but still concerned about all that went on, the Galactic Federation were decided in the decision that they needed to know for sure the Metroid threat was gone for good. In light of that, it was decided that a team would be sent to the Metroids home world (Planet SR388,) only the team consisted of elite soldiers and officers of the Galactic Federation Police Force, only the team went missing but not before they were able to send a single transmission. A transmission that barred a terrible message, the Metroid threat remained very much so alive. In a swift and unanimous fashion, the Galactic Federation decreed the universe would never be save for as long as the Metroid threat existed. With no other choice, they had to do something drastic. They had to send her. Ordered to battle the Metroid once more, Samus Aran is called to arms and sent to SR388 and that is where the game intro ends and gameplay begins. I am well aware of the fact that I probably should have busted the plot out earlier on in this review, but with so much to talk about, I felt it was just best to fit it in wherever it felt the most natural, so that’s what I did. But since we have arrived back to gameplay, on a serious note, there has never been a 2D Metroid game that plays the way that Samus Returns does. Granted it will take some getting used to for the original fans, there is no denying that the new Samus Aran is still very much so the old Samus Aran a lot of us fell in love with originally and for what it’s worth, when all energy is depleted, the new Samus is still up to her old tricks of shedding her armour and leaning backwards for the game over screen, like she did for Zero Mission and Other M.
Even despite my efforts to do so, after spending a two hours sat in a chair trying to best describe Metroid: Samus Returns, even after everything I have said about it, I feel no words can do it justice. It truly is a sensational work, with music composed by Kenji Yamamoto and Minako Hamano, who both previously did the music for various Metroid games and just when you think you have seen it all, the entire experience feels even more so surreal when it is played in a dark environment. Anyone can play it in a living room, during the day time, but when you slip under your quilt, or even your bed, Samus Returns becomes something even greater than it already is. So move over Trace, Samus is back and she’s reclaiming the Metroidvania sub-genre! It may not have been the Metroid remake MercurySteam wanted to do as they’d initially preferred to remake Metroid Fusion, but with a lot of love, respect and assistance from Metroid’s Series Producer Yoshio Sakamoto, Metroid: Samus Returns is without a doubt a 2D Metroid at its best. It respects the series in which it is a part of and it honours the game it is a remake of, whilst also being a Metroid adventure that new and old players of the original game can thoroughly enjoy. However it is a little sucky that part of the game’s content is withheld from those who don’t purchase the squidgy Metroid amiibo, still extra costs or not, Metroid: Samus Returns is worth the extra cost and it is without a doubt worth the long wait and a great way to get us all hyped before Metroid Prime 4 makes its way to Nintendo Switch! i can’t wait… this game better be on my doorstep when i get home! I can’t wait to play it. I am glad it turned out to be quite good. I still can’t believe I will be playing a new 2-D Metroid tomorrow. It sure has been a while.